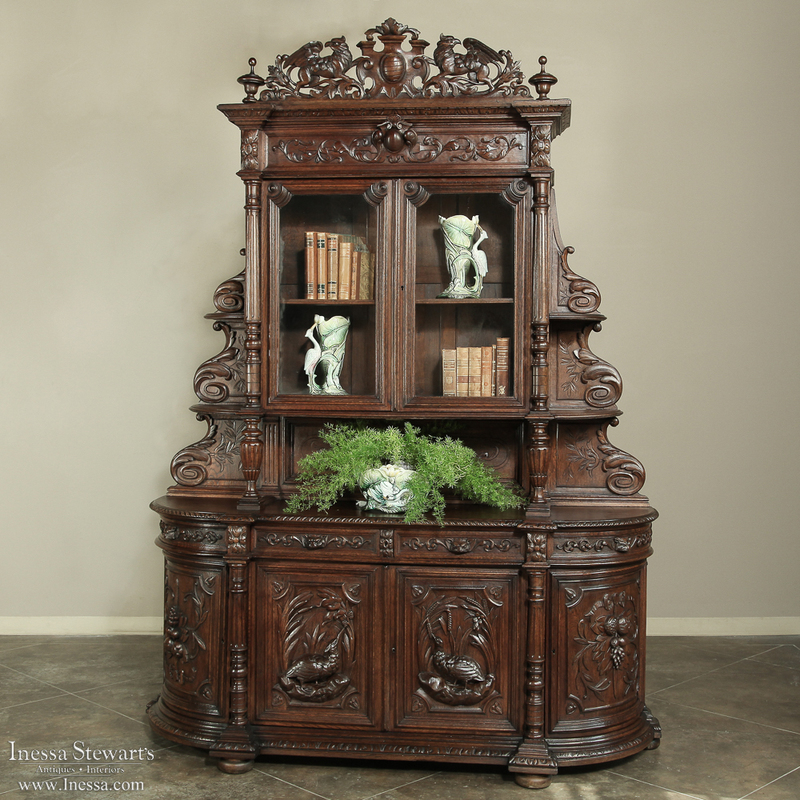 Hand-crafted on a grand scale from solid old-growth oak, this magnificent mid-19th Century French Renaissance Hunt Buffet will be an excellent choice as a bookcase or display case as well! Soaring over nine feet tall, it features scenes depicting the bounty of the earth appear on the rounded cabinet doors below with hen pheasants on the two center doors~all in glorious full relief sculpture. The serving surface is created by two carved pediments that support the upper glazed tier with candle shelves flanking each side of this amazing piece of antique furniture, leading the eye up to the exquisite pierce-carved drown on top. Such pieces were commissioned by affluent Europeans during the middle of the 19th century to display their books, which were considered prized possessions in and of themselves, and to illustrate the fact that the proud owner was also afforded a higher education which was reserved only for the top 1% of the population, if not less! An impressive status symbol of its day, such magnificent works of the cabinetmaker’s art can be prized and adored for many more generations to come. Circa 1840s, this piece measures 108H x 81W x 23D. We have even more examples to view in our Bookcases section of our website, as well as the China Buffets section!